Looking east onto the Massachusetts Turnpike from the Walnut Street bridge in Newtonville, where a 2.2-acre park is proposed at a cost of $46.5 million to $48 million. The proposal for park decks in West Newton and Newtonville is part of an ongoing effort by the city to create new rules for development along a 2.5-mile stretch of Washington Street, said Councilor at Large Susan Albright. Under proposed zoning for the area, developers would be able to build commercial buildings of up to 10 stories by special permit, but would also have to contribute to a fund to help support construction of the park decks, as well as improvements to the city’s commuter rail stations, she said. The proposal is intended to create new open space and help reconnect neighborhoods divided by the construction of the turnpike in the early 1960s, she said. Albright, who is chairwoman of the City Council’s Zoning & Planning Committee, said she hasn’t made a decision on the proposal, but believes officials should explore it. 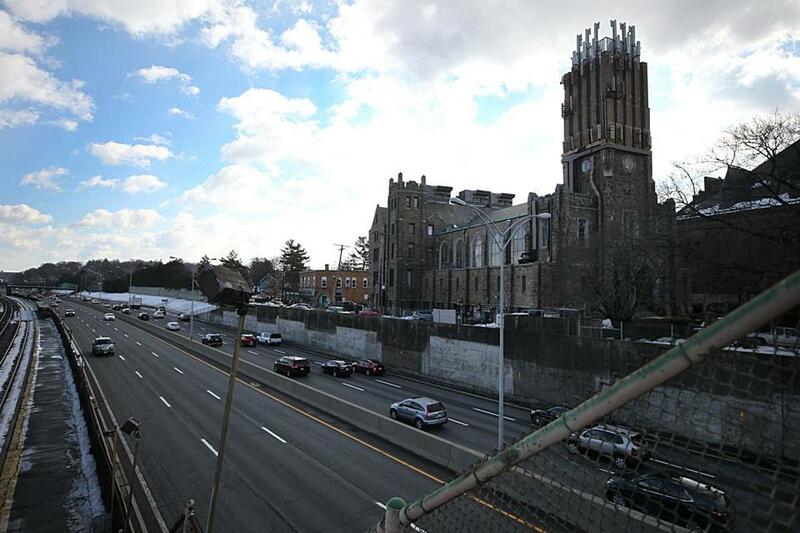 Under the proposal, a 2.3-acre park would be built over the highway by the West Newton commuter rail station, and in Newtonville, a 2.2-acre park would be built along the Walnut Street bridge. Both parks would include buildings that would house retailers and other businesses, according to the draft proposals. The West Newton span would cost an estimated $48.6 million to $50.1 million; the one in Newtonville could cost $46.5 million to $48 million, according to the draft proposal. The Washington Street vision plan also calls for construction of a deck over the turnpike in Newton Corner to serve as space for commercial development. The Massachusetts Department of Transportation has not received an official request or proposal to build over the turnpike in West Newton, Newtonville, or Newton Corner, according to spokesman Patrick Marvin. The Washington Street project was launched by Mayor Ruthanne Fuller last year to create new zoning rules along the roadway between West Newton Square and Newton Corner. Several projects are underway or have been proposed for the area. The zoning effort is meant to “put in place what Newton’s vision is” for the area, said Barney Heath, the city’s planning director. The planning effort has included residents, city officials, and businesses, with public meetings to solicit community feedback on potential zoning along the Washington Street corridor. We want “zoning that we feel is appropriate and have the development community react to that, in terms of what we’re looking for,” Heath said. The Zoning & Planning Committee is due to consider the Washington Street plan, including the park decks proposal, during meetings later this month and in April, Albright said. Comments on the proposal will go to the project consultant, Principle Group, which will produce a third draft in late April. The City Council could get a final version of the vision plan and proposed zoning rules by June, she said. Albright said she needs more information about what a 10-story building would look like along the turnpike in Newton, and how it would affect nearby residents, before she makes a decision, she said. The proposed zoning sets aside spots in West Newton and Newtonville where buildings of up to 10 stories could be constructed. “We need to see what this is going to look like, and then we can decide if it is a good tradeoff or not,” Albright said. Newton, like other cities reshaped by aggressive highway construction during the mid-20th century, saw the obliteration of hundreds of homes and businesses, along with the displacement of residents, because of the turnpike. Before construction of the turnpike extension commenced in 1962, the state and Newton battled over the toll road. Callahan and Gibbs ultimately reached a deal: The highway would be built in exchange for some concessions, including money for a new fire station, some traffic improvements, and preserving the Elks building in Newton Corner. Since the turnpike extension opened in 1965, Newton has been cleaved in half by the highway, tied together only by a series of bridges that span the road. The park deck proposal stems from feedback from residents as officials developed the Washington Street plan, Albright said. “Finding ways to link both sides of Newton back together again was a very strong request,” Albright said. In recent years, cities across the United States have been turning to parks as one way to reverse the impact of highways on local neighborhoods, said Ed McMahon, a senior resident fellow with the Urban Land Institute in Washington, D.C. Among them have been Boston, which built the Rose Kennedy Greenway in 2008 as part of the Big Dig; Dallas, which opened Klyde Warren Park in 2012 in the city’s downtown; and Pittsburgh, where officials last year approved building a park over Interstate 579. “Parks increase value, they provide people with places to get recreation ... and they can bring communities back to life again,” McMahon said. But building a park over a major highway comes with risk, said Angie Schmitt, editor of Streetsblog USA, an online news site that covers transportation. Those parks could go underused, plus officials have to address the noise and pollution generated by automobiles using the road. Among those who are skeptical of the proposed turnpike park decks in Newton is Colleen Minaker, who serves on the Newtonville Area Council. She’s concerned about the city’s share of the cost for a park, especially since residents have other options, she said.